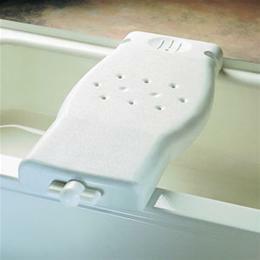 Lightweight, convenient bathtub seat for traveling or when a back support is not needed. One-piece, blow-molded bench has textured seating surface. Extra large adjustment knob adjusts width to secure the clamps to tubs. Nonslip rubber pads protect bathtub surface. Built-in soap dish and hand-held shower nozzle. Adjust Width: 23(1/4)" to 26(1/2)"